WHY CHOOSE PRO TINT FOR WINDOW TINTING? YOUR VEHICLE IS AN EXTENSION OF YOUR STYLE & PERSONALITY. When you outfit it with LLumar car window film from Pro Tint in Plano, you’ll turn heads on Dallas highways and feel more comfortable everywhere you drive. Available in a variety of charcoal colors to match your car's specifications, LLumar automotive window film enhances your vehicle's appearance and increases your privacy, but more important, it protects you from the heat and UV rays that accompany the Texas sun. Professionally installed by our window tinting experts, LLumar blocks 99% of harmful UV rays and reduces your interior car temperature by up to 30°. Every custom window tinting project is backed by our own customer satisfaction guarantee and a lifetime limited manufacturer’s warranty, so you can feel confident you’ll be protected for years to come. "They are currently working on the 3rd car they have done for my wife and I. They have done an awesome job each and every time. Oldest job is 6 years old and still looks as good as the day we picked her up." "Had both of my cars tinted here. They do quality work with the best film. Highly recommend". "Very quick. Very professional. If you need tint, this is the place to go!" 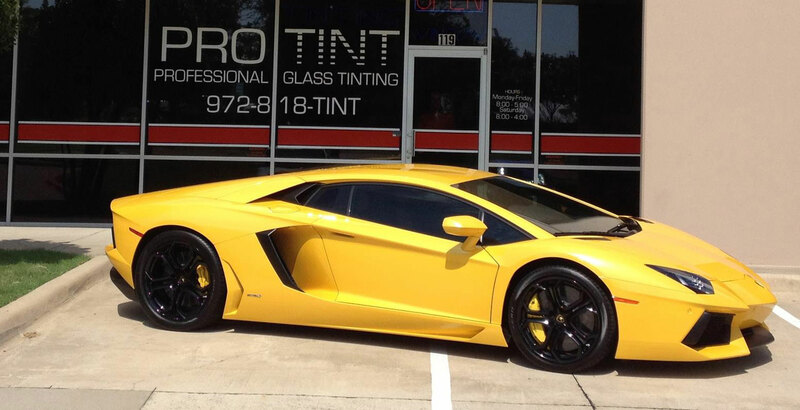 Contact Pro Tint in Plano for your no-obligation estimate!